If you want to know the truth, I usually cut my hair myself! 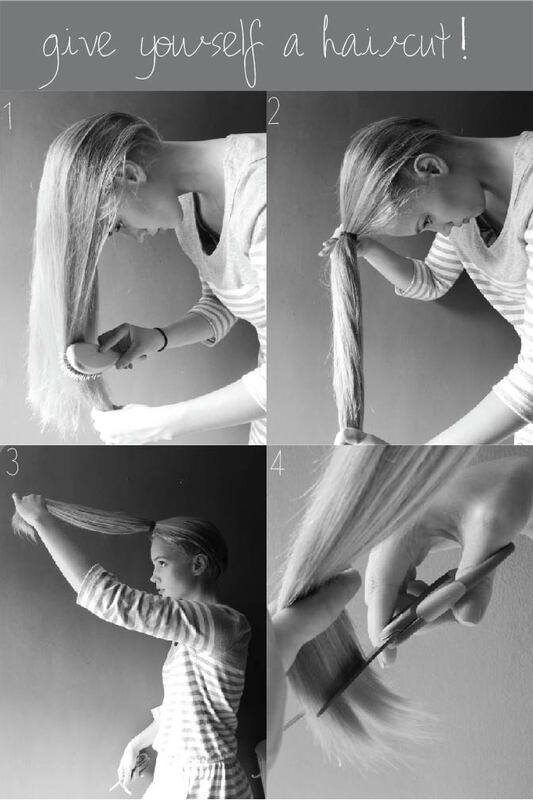 It is super easy if you just gather it all in a pony tail and hold it at a few angles. Follow along for a full tutorial. 1. Brush hair so it is smooth and in the front of your head. 2. Secure your hair with an elastic. This pony tail will feel totally silly but that’s what you want! 3. Pull your pony tail up at a 45 degree angle and use your fingers to pinch the ends and hold the hair. 4. Bring the ends down and cut them in a straight line. This will create more choppy layers and some that frame your face in the front. 1. Brush your hair into a high pony at the crown of your head. Secure this with an elastic. 2. Next, pull this at a 45 degree angle away from your head. 3. Pull to the front and cut at a straight angle. 4. VOILA! This is the end result of both cuts. While the first cut will give you choppy layers, this second one will give you more subtle long layers. Neither really take of much length, so if you want to trim your hair to the desired length beforehand that would be a good idea. I usually don’t need much of a trim while doing this technique, and it has been really easy to grow my hair out this way because it gets rid of a lot of the dead ends while still keeping length.